In 1979, John was one of the founders of Crescent Arts, the gallery and artists’ studios complex in Scarborough. Situated in the spacious garden-basement areas of Scarborough’s main Art Gallery, Crescent Arts has, over the years, proved to be a vital and influential ‘living arts’ institution in North Yorkshire, with a remarkable exhibitions record of contemporary visual arts. Its current resident artists continue to provide workshops and activities for the wider community. As the first event of the commemorative year, John has been asked to mount a solo retrospective exhibition of his prints in the gallery of Crescent Arts, from March 1st to 31st. 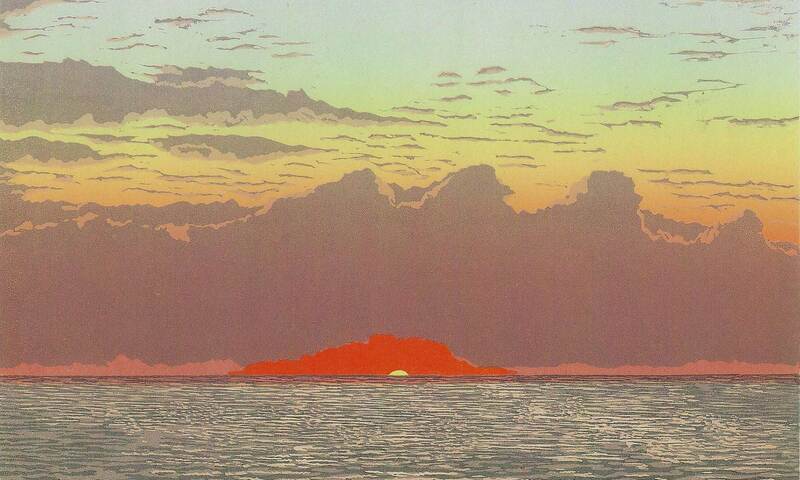 In total, he will show approximately 40 prints representing 25 years of printmaking. This exhibition is now in the planning stage. A current possibility is to present some of the prints as related pairs, either with deliberate or incidental compositional relationships. See print 1 with print 2 below and print 3 with print 4 below. Some other prints will be shown as existing self-contained suites, as exemplified by the ‘Zodiac’ set. Currently John is working a pair of related prints, both being based on 19th century prints of flowering plants – a honeysuckle and a convolvulus; see initial images 5 and 6 below. Each print will also incorporate embossed lettered titles and alternative names of the plants. I taught as a lecturer in art for 20 years at further and higher education levels before taking early retirement to concentrate on printmaking from my home-studio at Staintondale on the Yorkshire coast. I was visiting lecturer at the Museum school of Fine Arts, Boston, Massachusetts, a founder of Crescent Arts Workshop in Scarborough, and instigator, in 2003, of the annual Yorkshire Coast Open Studios event, which was expanded later to become the North Yorkshire Open Studios. For a time I worked with Katie Clemson, the Australian Printmaker/author, at her White Gum Press studio in the New Forest. I specialize in figurative colour linoprints, my subjects being derived from memorable sightings and occasions, and often based on my coastal or moorland surroundings. My prints have been widely exhibited and sold over the past twenty years or so (an exhibitions listing is available if required). A recent work is a suite of twelve 'Zodiac' prints, derived from mediaeval stained-glass imagery. There is no single theme in my work, nor any particular issue to pursue through it. I am a member of the Printmakers Circle, a group of professional printmakers across North Yorkshire who embrace original printmaking in its many different forms, exploring a wide range of traditional and contemporary methods and techniques. We meet regularly to discuss and share all aspects of working as artist/printmakers, and exhibit together occasionally to showcase the quality of original printmaking in this part of the country. I try to explore varied interpretations of my chosen topics by modifying the printing techniques. The prints are produced by the 'reduction-block' method, by which successive overlaying colours are printed progressively from the same linoblock or blocks, with the block(s) being cut or etched away (ie 'reduced') between each colour stage. This ensures accurate colour registration, but also means that only one edition of each complete image is possible. I use an 1840 ‘Albion’ cast-iron platen handpress to produce my prints. Representing the goddess of beauty, Aphrodite, and the god of love, Eros. Changed into fish by Zeus to escape the evil Typhon, then swimming down river to safety. As Zeus, washing away all evil beings from heaven onto earth; with the tri-faced Roman god Janus, guardian of doorways; from his name ‘January’ and ‘Janitor’. The Babylonian or Sumerian fish-goat; also the goat Amalthea who fed the infant Zeus. Debatable connection to Pan, the god of forest, woodlands and nature. Shown as the centaur Cheiron, friend of Heracles who accidentally shot him with a poisoned arrow. Upon death he was elevated as the star constellation Centaurus. From the story of Orion the Hunter who was stung to death by a giant scorpion. The time of year when vatting up the new wine is another ‘Labour of the Month’. Balancing justice and held by Themis, goddess of divine justice and mother of Astraea. The star constellations of Themis and Astraea (in Virgo) shine side by side. This is Astraea, goddess of purity and innocence who, after Pandora had opened her box and let loose all evils into the world, was the last deity to return to heaven. An image derived from the first of Heracle’s trials, defeating the Lion of Nemea. Showing also one of the ‘Labours of the Month’ – the grain being harvested. Known also as the Roman gods Castor and Pollux, sons of Leda, and whom the Romans believed would lead their armies on white steeds and in armour. This is derived from the tale of one of Zeus’ many affairs – that with Europa, to whom he was so attracted that he came to her as a bull, making him irresistible. The origin of this image is from the Greek myth of the Ram with the Golden Fleece which was ultimately sacrificed, and subsequently placed among the stars by Zeus.